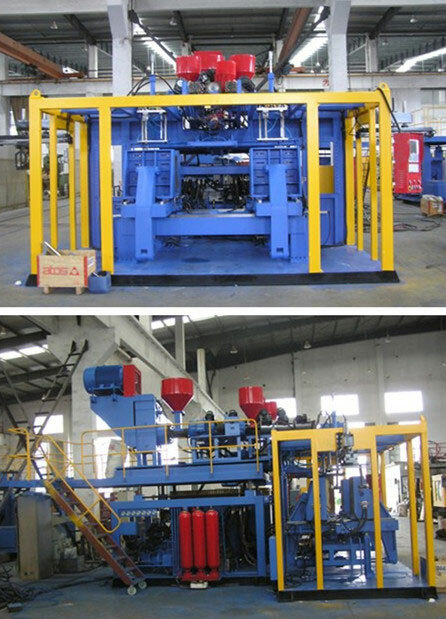 Co-extrusion plastic blow molding machine | Silver Python Machinery Co., Ltd.
Co-extrusion plastic blow molding machine, also is known as multi-layer extrusion plastic blow molding machine, is the use of two or more extruder, the same or heterogeneous thermoplastic plastic melt in a different extruder in the machine after the composite, Extruding a parison with a multilayer structure and then blow molding into the blow mold. At present, extrusion blow molding is in the direction of multi-layer blow molding development, so as to make full use of the advantages of each layer, and can improve the overall performance of the container. Multi-layer composite plastic is developed on the basis of ordinary plastic extrusion blow molding machine, the process is similar, but the container is multi-layer or more layers. The higher the technical requirements for the molding process. Composite container is characterized by the barrier layer, adhesive layer, the outer layer, and the contents of the contact layer and other materials. According to the role of each layer can be divided into grass-roots level, functional layer and adhesive layer. There are many types of coextruded blown containers. Composite layer is generally 2-7 layers, so that the advantages of multi-layer plastic can be combined. Multi-layer composite containers are mainly used for food and beverage chemical reagents and pharmaceutical and cosmetic packaging, the main features of such containers are as follows. 1. can increase the barrier properties of the container and prevent the effects of one or more specific substances or the environment (eg oxygen, carbon dioxide, moisture, fragrance, moisture, ultraviolet, solvent penetration). 2. can improve the light shielding of the container, such as the colored shading layer and the general combination of coloring layer, can greatly improve the shading. 3. in the premise of ensuring the performance of products can be used in the middle layer of waste or lower prices of plastic to reduce the use of higher prices of barrier resin, thereby reducing the cost of barrier-like containers. 4. can be made with a special structure of the container, such as with a soft and hard structure, window, non-foam layer / foam layer / non-foam layer of the barrier container. 5. can be used in the outer layer of colored plastic or glossy prints good scratch resistance of plastic, improve the surface properties of the container.